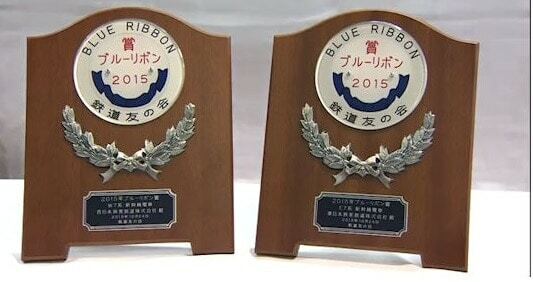 The Blue Ribbon Awards are film-specific prizes awarded solely by movie critics and writers in Tokyo, Japan. The awards were established in 1950 by The Association of Tokyo Film Journalists which is composed of film correspondents from seven Tokyo-based sports newspapers. In 1961, the six major Japanese newspapers (Yomiuri Shinbun, Asahi Shinbun, Mainichi Shinbun, Sankei Shimbun, Tokyo Shimbun andNihon Keizai Shinbun) as well as the Japanese Associated Press withdrew their support for the Blue Ribbon Awards and established the Association of Japanese Film Journalists Awards, (which were held a mere six times). In 1967, the awards were cancelled as a result of the Black Mist Scandal, a baseball bribing case. In 1975, the awards were revived, and have continued until the present day. The annual award ceremony is held in a variety of places in Tokyo every February. Although the award is not acclaimed highly on an international level, due to their long history and the rigorous screening process, the Blue Ribbon Awards have become one of the most prestigious national cinema awards in Japan. Along with the Kinema Junpo Awards and the Mainichi Film Concours. Winning one of these awards is considered to be a great honour.